Hi, I have been the owner of a male and female Betta fish since December 2017. They currently reside in a 5 gallon tank with a divider in the middle. I recently added 2 mystery snail to the aquarium about 2 months ago and needless to say, my female Betta died shortly after introducing the snails to the aquarium. 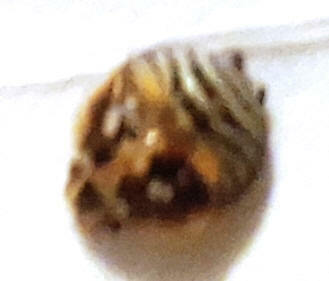 I have not had the chance to remove the snail and today, I found this bug on the mystery snail (who resides in the side where the female Betta used. I have no clue what this bug is and if there is more. I have tried to look on line to find it and I had no luck. Any clue as to what it is?? I have now removed my male Betta from the aquarium as I don't know what to do beside clean the aquarium and remove the snails permanently. with your experience, do you think that I would be able to put 2 male half moon Betta together in a 800g planted tank? my tank is in a ‘’L’’ shape (each side of the ‘’L’’ are 8 feet long), and was wondering if in this size the aggression will be the same between the Betta as it would in a smaller aquarium. I didn’t find anyone who had try it or know enough to make a good judgment. I was wondering if female Bettas are destructive in groups? How do I tell the difference between (a betta with) shredded fins from fin and tail rot, and shredded fins from an overly aggressive blue paradise gourami? 8/23/06 < I'd wager it is more likely from violence. > I've been trying to help the betta and the gourami get along, but they seem to be incompatible. < I cannot seem to come up with a way to achieve this insurmountable task. It is direct competition, and the betta is ill equipped for the job at hand. 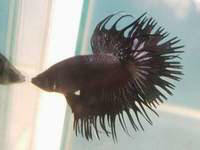 If he were a true fighting betta with short fins, he might stand a chance. > I think I'm just going to have to give one of them away. < That sounds like a great idea. > They're in a 5 gallon aquarium with physical, chemical, and biological filters (AquaChem Hex 5, I think). Tank chemistry is still a little squirrelly, but I'm working on that. Temperature is steady around 80 degrees. They have live plants and a "cave" (coffee cup) that they both use. At first the betta was aggressive, chasing and biting the gourami, so I sequestered him in a breeder net for a few days. After I let him out, the gourami became aggressive. He's been chasing the betta, even sneaking up on him so as to have a better chance at doing some damage. < That's typical for Gourami types: Ambush style tactics. > I came home from work the other day to find that the betta was missing about half his plumage. All shredded and ragged looking. The gourami is now sequestered as a result. I suspect the gourami has been tail nipping, but I saw pictures of fin and tail rot that looked just like the Betta's condition. What should I do? < When in doubt, do partial water changes. If the water quality is causing the infection, dilution will correct the situation, and allow the fish in question to heal. Fin rot usually has well defined white edges, while damage from violence is more erratic. > Any help you could give would be greatly appreciated. Thanks a bunch! < Hope I helped some. RichardB > Susanne. Re: Betta and Gourami 8/24/06 Thanks, Richard, for your reply. < You are very welcome! > Very helpful. < Not all would feel that way, but thank you! > I'll give away one of the fish, and move the Betta to a large bowl in the meantime. < That is a wonderful idea. Remember to do partial water changes at least once a week, to ensure water quality. Good luck! RichardB > S.
Hi-Fin Tetras with male Betta? I have a male Betta in a 2 gallon and 2 hi-fin tetras in a 30 gallon tank (they are separated in a breeder net from the general population due to fin nipping). I would like to move the Betta into the 10 gallon along with the hi-fins. Can I do this? Which fish would work best for cycling the tank better? < Either fish would work fine for cycling the tank but the tetras would surely nip the bettas fins if they were placed together.> The hi-fin or the Betta? How long should I let this tank cycle before adding any fish at all? <Place some gravel from the 30 gallon tank into the new 10 gallon tank. The bacteria on the old 30 gallon gravel will now start to grow in the 10 gallon. Check the ammonia with a test kit often. It may or may not spike. Overall I think I would leave the Betta in the 2gallon tank and place the tetras in the 10 gallon after a few weeks then you could add some new fish. I would use a 5 gallon for a quarantine tank because most medications are dosed out in 5 and 10 gallon increments.-Chuck> The reason for moving the Betta is that I would like to use the 2 gallon tank as a quarantine tank in case of illness in the future.